Fundraising | Suzi's Knits: Footfalls & furballs! You are currently browsing the category archive for the ‘Fundraising’ category. And the winner is… Rob! I’d like to thank each and every one of my sponsors. I was very happily surprised at the outpouring of support from so many directions, and really did NOT expect to meet my goal til well into summer at least. You guys are all amazing! Tune in tomorrow as I strongly suspect the AIDS marathon folks will twist my arm into setting a new goal. This is about supporting our community and people in need, and every little bit helps. I’ve never been the sort to stop at the minimum or I would not have signed up for this effort! Nothing like getting a knitting project to finally turn out right to improve your mood! Also, some SCCPA stuff with the webmaster turned out to be not quite so bad of a disaster as I had thought (although the man DID still defend his right to include spamming the entire membership as a requirement of his contract. ew, ick, need shower). The sun was shining, it was WARM and Peter was in a running mood too. We decided to take it easy on him so he could keep up with me, and cut the usual run short to 3 miles. It cuts out one last long (3 mins at least) hill and keeps in most of the prettiest parts of the run. Peter really did keep up. In fact, he seems to go a tad FASTER than me at the start of a 4 min interval (and we just will kindly neglect to mention the huffing puffing end of a 4 min run interval). I was feeling very good – I swear I get high off of sunshine and there was plenty of it today. So I decided to be a show off and when we got back home I took 2 laps around the park, adding another mile and a half and a good several hills. The first lap I actually ran the hills faster than on the way out. The mostly flat run home actually got me really charged up and no hill was gonna stop me. besides, there were entertaining people racing each other in the park and cute kids that hugged random smiling strangers and other fun stuff. The second time around the hills definitely did not win, but I swear they got longer and steeper… 😛 I decided 4.4 miles is far enough and didn’t go for 3. Total time was 52:30, including a little extra walk on the way home after Peter met a very unfriendly sidewalk crack. Its very good to know I can shorten the main route and make it up almost exactly by throwing in the park. Made for a good hill practice run. next week tho I swear I’m gonna try for the real hill….. The ones in SF look long and not tortuously steep and Mt. Pleasant road will be good training if I can ever get myself to try! I try my darnedest to thank everyone who has supported me personally! Only… I don’t remember where I know you from… 🙂 Your support out of the blue means the world to me and I greatly appreciate it. Thanks on behalf of the 130,000 people in the SF area that depend on the foundation for treatment and other services! So about a week ago, the AIDS marathon people moved offices. For 2 weeks they were packing and unpacking boxes. Seems that nothing on the website is automated and a human has to actually link up each donation to each runner (Hey any web coders out there reading this, wanna donate some time? THEY NEED HELP!) All of a sudden today I log in… $1,298.12?!?!? Add in the proceeds I’m donating from Suzi’s Knits that I haven’t sent over yet and I’m up to a grand total of $1362.65! 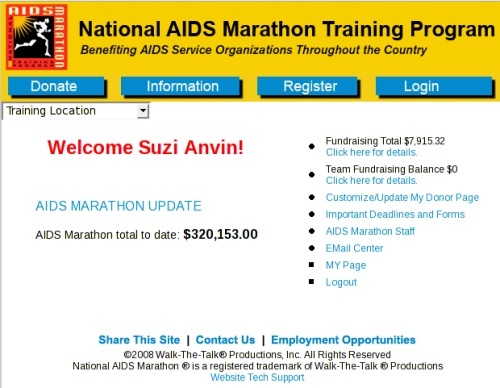 BTW another frustration is the slow feedback from the AIDS marathon folks. Can you believe it takes almost a week for them to post web donations??? 😛 I don’t even know if people are annoyed or if droves of friends have showed up and sponsored me. 😛 I so need to nag them about this. At any rate if you’re one of those friends… I’d really appreciate if you drop me a line with the donation! On my sponsorship page, there is a little line on the left that says “e-mail the runner” I LOVE getting e-mails thru the site! 🙂 let me know what you think. Thanks!